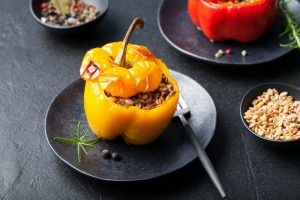 These stuffed peppers are packed to the brim with flavorful and healthy fillings, so it’s easy to see why they rank as a winner. Wash the peppers and with a knife cut out the stem at the top and then remove the seeds inside – leaving a hole at the top of the peppers to put the minced meat inside – make sure the hole is not too big so the filling stays in better. In a bowl mix together the egg, washed rice, chopped onions, garlic, and parsley. Add the minced meat, season with salt and pepper and mix with hands. Stuff the mixture inside the cleaned peppers. In a pot fry in some olive oil two tablespoons of flour until light brown, add the tomato puree, Sadie’s Kitchen Chicken Bone Broth, salt, pepper, bay leaf and let it boil. Then add the stuffed peppers, add more water and cover and cook on a low heat for 45 minutes.